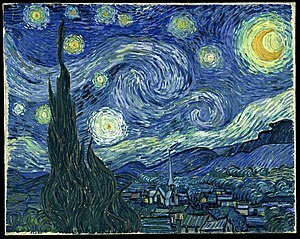 Vincent van Gogh, The Starry Night. Oil on canvas, 73×92 cm, 28¾×36¼ in. A fantastic visualization by NASA’s Goddard Space Flight Centre of the ocean surface currents around the world. 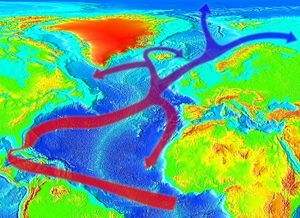 The Gulf Stream, the Labrador Current, the Agulhas current, can all be seen (even though they are part of the thermohaline circulation system) and remind one of Van Gogh’s Starry Night. Of particular interest are the localised but still large-scale Eddie currents existing within or spinning the larger currents.